I’d already heard that Mike Robins, the custodian of St Andrew’s, does a fantastic job so I jumped at the chance of a private tour of what is the first example of the Italian Quattrocento revival in England. St Andrew’s was built in 1828 adjacent to the original Brunswick Town though it wasn’t designed by the same architect, Charles Augustin Busby. Unsurprisingly, Busby was furious when he heard that the landowner, the Reverend Edward Ederard, had picked Charles Barry instead. At the time, Brunswick Town was surrounded by countryside with Hove and Brighton to the west and east respectively. There was only room for one church in the self-contained community and Busby wanted to design it. Busby had already designed the original Kemp Town (Lewes Crescent, Sussex Square, etc) though Barry, later Sir Charles Barry, did go on to design the Houses of Parliament (which I now get to see close-up every day!). Portland stone and stucco cover the façade whilst the sides are just plain brick. There are three entrances, one for each of the social classes of the day, with a secret tunnel to the pub opposite. 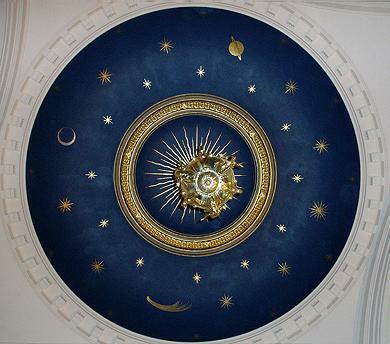 In 1882, Barry’s son, Edward Middleton Barry, was employed to add a proper domed chancel which makes a beautiful internal focal point. During the 1920s, stone replaced the wooden floor and the interior was deliberately simplified though fine detailing was left on important features such as the dome, altar and stained glass windows. Tragically, there was a lot of damage caused by squatters in 1995. Today, the church is owned by the Churches Conservation Trust and there is just one service per year – around St Andrew’s Day, of course. It is generally open 11:00am-4:00pm Tuesday-Saturday with plans underway to repair the heating and clock. This weekend, a sponsored walk is being held to help raise funds for the church with Bert Hobden, a 91 year old former choir boy, taking part. Unfortunately, Mike is soon to retire and will be leaving the church in the capable hands of the very local Friends of St Andrew’s. He asked me to mention that he will be continuing his tours of Brunswick Town every Sunday at 2:00pm by the Peace Statue and may be contacted on 07900 844951 or 326491 about this and all other matters. He is also looking for a publisher for his book, aptly named, ‘Six Months in an Empty Church’.